Ah yes. Me = fledgling yarn snob. 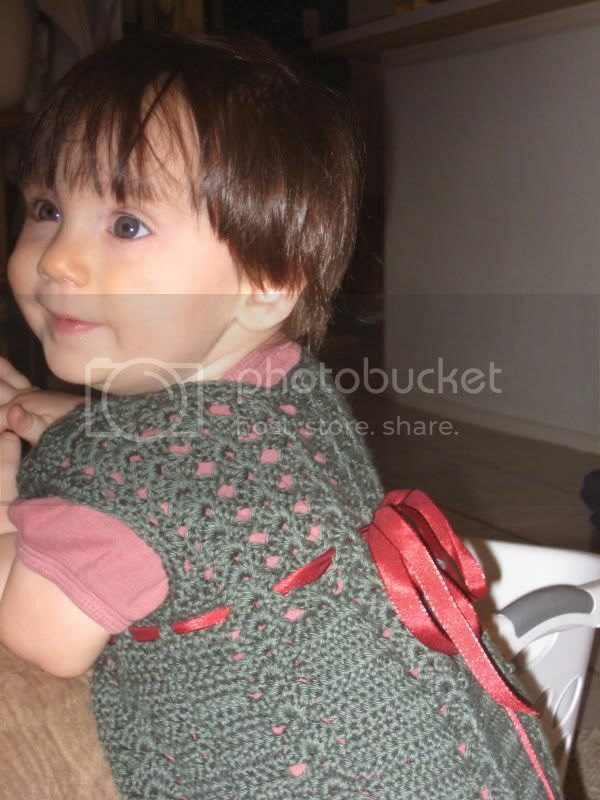 I finished Chiara's Holiday dress today. I had finished the crochet but was just putting off whipstitching it for days. 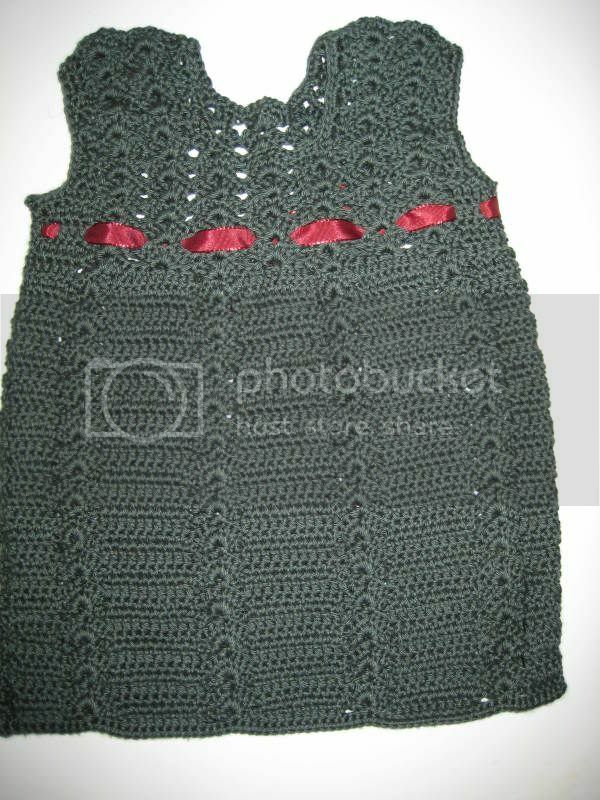 First is a picture of the dress as I finished it. Then, once we added the ribbon. 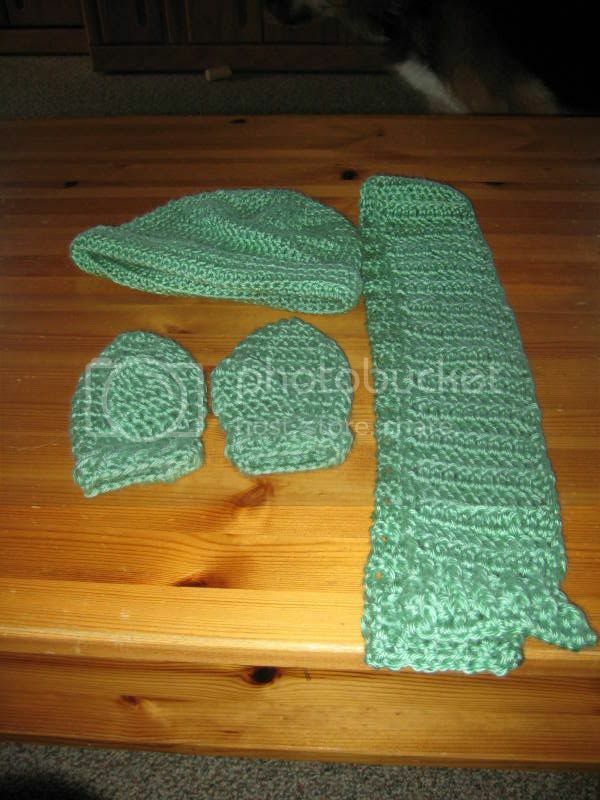 I whipped up a hat, scarf, and mittens from our cache of yarn for a child for the Christmas project. The dress is very cute JustSkipIt, and she looks adorable in it. I love going to conventions. I would love to meet Alyson or Amber. I was so excited when I got to meet Teryl Rothery!!! I was practically drooling. Searching through the App store on my iPhone for cool apps and games. OMG! OMG! OMG! I COLLECT BOUNCY BALLS TOO!!!!!!! !!!! I THOUGHT I WAS THE ONLY ONE! *stops yelling* sorry! ! when i walk past one of the machines i HAVE to buy one, and if i dont have enough money on me i HAVE to go back there within a week with the right amount just to get one iiiits an obsession i completely understand..
"If you know your Bible,Shakespeare and can shoot craps, you have had a liberal education." Last edited by Karzia on Mon Jul 16, 2012 8:13 am, edited 1 time in total. The app store is soooo addicting. I'm guilty. Last edited by WillowandTara on Mon Jul 16, 2012 8:13 am, edited 1 time in total. I've finished three projects recently. The first is a baby blanket but I didn't upload a pic of it. It's baby blue and was a very easy pattern that I enjoyed doing. Then I did a little dress for a fundraiser at my work. 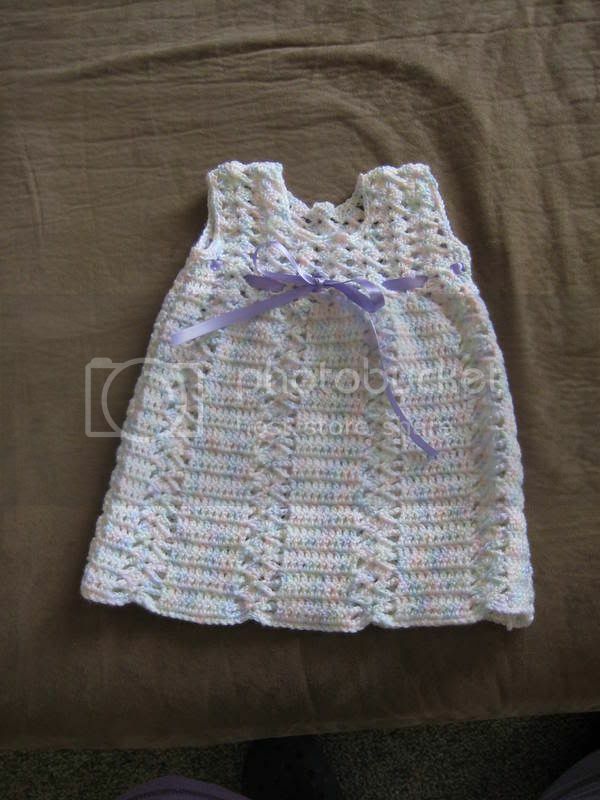 It's the same pattern as I used on Chiara's Christmas dress. It only took me a few days. Then I finally finished Asher's purported Christmas Sweater. I've posted the whole frustrating saga of making it. 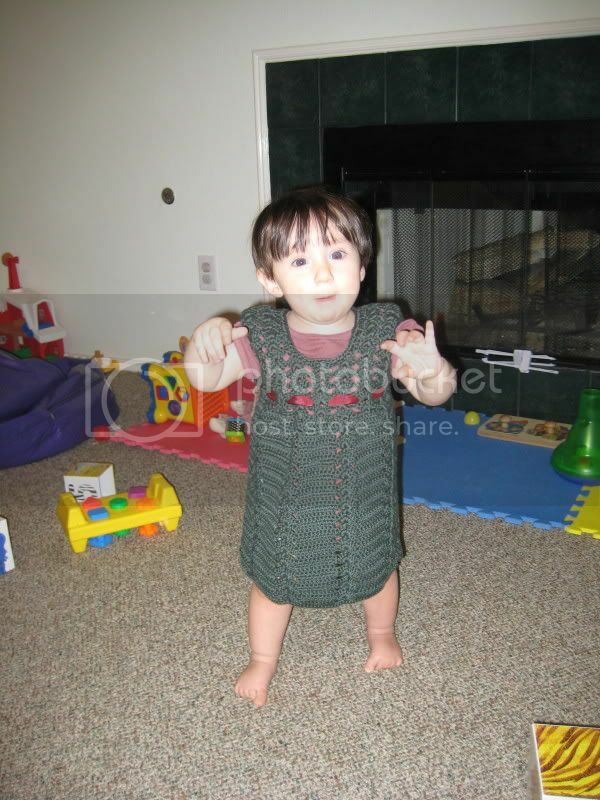 But I think it looks great and it's very soft. 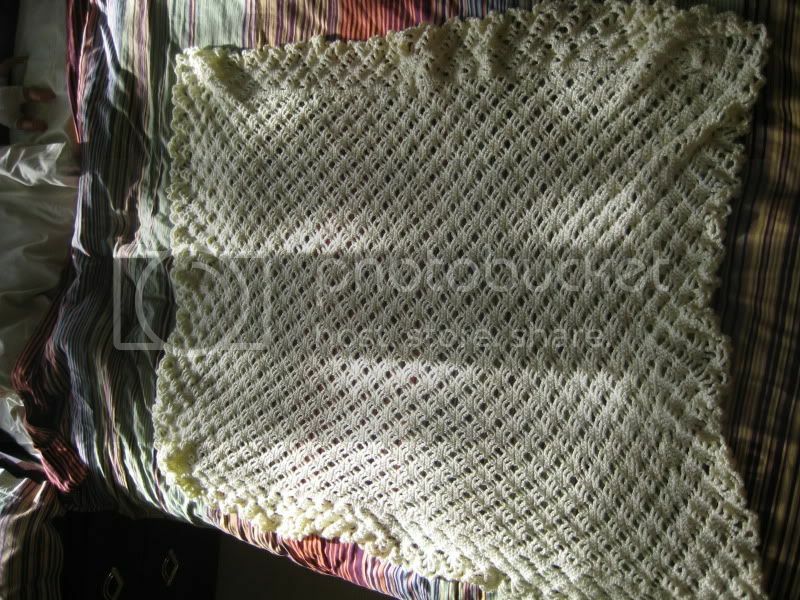 Yesterday I finished a baby blanketfor my cousin's baby (due June 20). 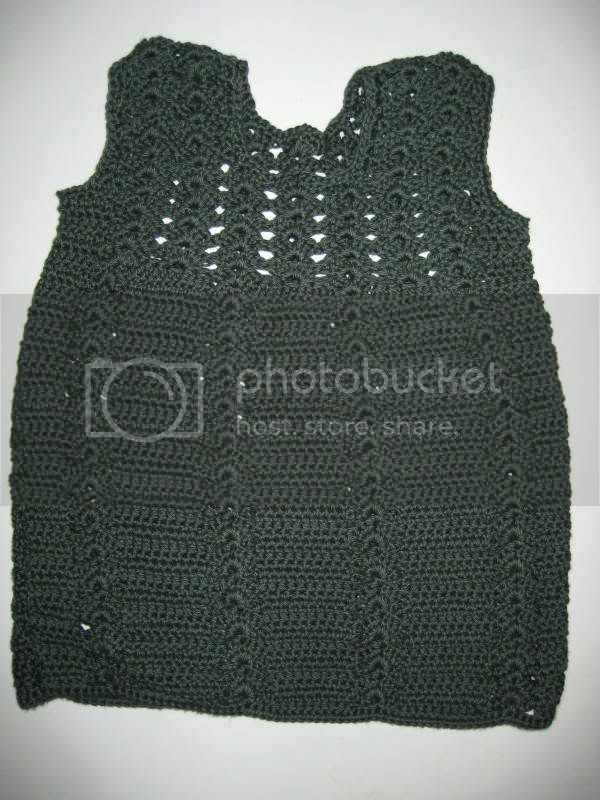 The pattern was very confusing to me for about 40 rows and then became very obvious although it took longer than I expected it. It has a bunch of rows and then a 13 row border. I thought the border would take days but I did almost all of it yesterday while I was home sick from work. Now I'm suddenly without an urgent project on which to work. I thought about making a big brother blanket for a co-worker but I'm not sure that our relationship warrants that. And I've thought about making some hats and such for my wife's new ETSY store. I'm not sure. I finished a large afghan for my niece. She's 10 so when she was a baby I didn't crochet yet. I thought this would be something that would kind of grow up with her. 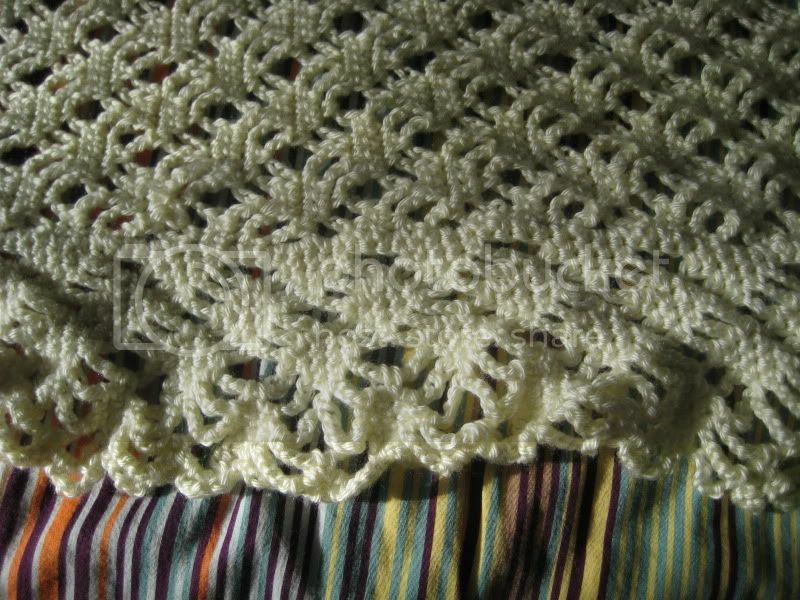 It's filet crochet which is supposed to be done with lace but it came out really well with yarn. It's shown here on a queen sized bed but she has a full. I haven't been around here in a while - since June I have been collecting vintage 1980's He-Man/Masters of the Universe figures,playsets and vehicles, almost have about fourty. I finished the last blanket in this album this week. Swirly. It was fun to do and the worst part was all the whipstitching. I made a baby blanket for my friend who is expecting a baby in a few weeks. I really enjoyed making this one even though I had to whipstitch it together. Then I just finished a big brother blanket for her 3 year old son. Here's the link to the pictures. They're the last two blankets in the album. Reading, drawing, playing drums and guitar, music in general, studying languages, gaming, going for late night tea with friends, and I'm sure attending conventions will be one of my newest hobbies seeing as how I was just given VIP tickets to the Buffyfest comic con in Toronto next month! Let's see . . . I love reading but that's more a necessity than a hobby! I write/direct/perform in cheesy melodramas and also choreograph basic swordfights. Teach improvisation, also how to create driftwood mobiles. Lately I've been dipping my toe in the water of jewelry making. I have been toe dipping in bodies of water regularly these last months. Photography is one of my favourite hobbies. 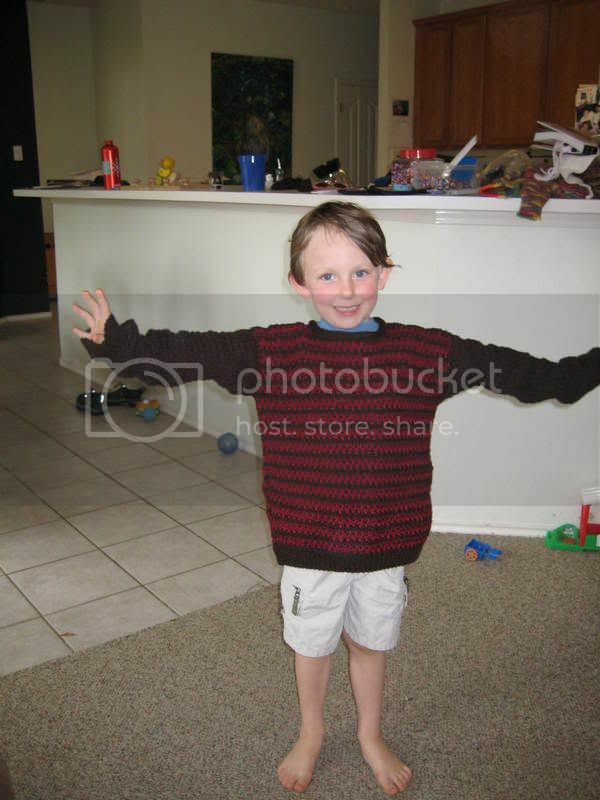 omg JustSkipIt... that is the cutest kid I've ever seen. Also a very nice dress. I used to play rugby and fence and do archery. Lately I've been staying up till 4am on my computer to avoid my sick, sad life of hobby-less-ness. Looked over your album, OMG just doesn't cover it! Beautiful, beautiful work! My ex-wife made her living working at Lacis in Berkeley, doing antique fabric restoration. She also tatted and knitted professionally and wrote a book on simple Lucet patterns for beginners. Bottom line, I have respect for the "womanly arts" and your stuff is amazing!!! Your hobbies are writing, reading, and becoming a KB story expert very quickly! Cool on the fencing and archery - I was into those in college as well. Used to belong to the SCA and had some fun with that, creating characters, etc. Thanks for the kind word, love your avatar and your energy! Definitely a spirit-based person. Another hobby, for me, is getting to know people - I like that! I going to link to my blog which has pictures and the story behind the two blankets I finished in April & June for our friends's new baby and their son (4 years old). I'll sum it up to say that the big-brother blanket was my favorite project ever. I loved it! My new hobby? She's lending me her accordion. I'm going to learn to play it and we're going to start a klezmer/oompah band. little.hesperides - How awesome! I met a girl at a party once who had her accordion with her and started playing. Apparently she always takes it so I asked her about it. She said that her mother put her and her two siblings into accordion lessons as kids because she said there would always be a need for polka musicians and that she was right. I finished an afghan for my mother in law for Christmas. You can see pictures here.